If you had asked us five years ago what we thought the future of gaming would be like, we probably would’ve told you about VR/AR (still in its infancy back then) and the inevitable shift to 4K. But the idea of using a smart speaker (which, at that point had only just come out) as a way to play games, well, that thought would’ve never crossed our minds. While we never saw it coming, there are now tens of thousands of people using the Amazon Echo and Alexa to play games. Some of these experiences (or 'Skills' as Amazon calls them) rank among the top apps on the Alexa Skill Store and have even garnered attention from traditional game developers like Bethesda and Bungie. The only problem with Amazon's brave new world of audio gaming, however, is that, just like the App Store or Google Play Store, there's a lot to sift through. To help contextualize the rise of voice gaming and give us their top Alexa game recommendations we spoke with Paul Cutsinger, Head of Voice Design Education at Amazon. What follows are his thoughts on where voice gaming has come from, where it is now and where it will go later. While games have always relied on audio to make them more immersive, very few games over the years have completely relied on audio as their sole way to interact with the player. But according to Cutsinger, that limitation on the Amazon Echo actually works to its advantage. “Voice games bring a few unique characteristics so the kinds of games that tap into those stand out to me," Cutsinger told us over email. Those characteristics, namely, are imagination and communal play - or more explicitly the idea that audio games require you to think a bit more than traditional games do, and they can often be played with a larger group than most other games. To that end you can expect the future of voice games to add in an ounce of visuals while still working primarily with voice as an interface. So what should you be playing on your Alexa device? Here's what Cutsinger recommends. § Destiny 2 Ghost by Bungie/Activision – The Ghost Skill brings your in-game Ghost companion to life, giving you an exciting new way to play and interact with the Destiny 2 game on PS4, Xbox One or PC. § Call of Duty by Activision – Your personal Call of Duty coach; with a simple voice command, Call of Duty provides you with critical intel, personalized instruction and essential after-action reports in real-time so you can take your game to the next level — whether you're a battle-hardened vet or rookie. § Elite Dangerous Hackster.io Winner – 16-year-old developer implemented Alexa into his space ship in Elite Dangerous, an exploration, trading, and combat game, in which you can explore the Milky Way Galaxy on a galactic scale. § Earplay by Earplay – Interactive audio stories you play with your voice, featuring voice acting and sound effects like in a radio drama. Team is made up of gaming industry vets (Telltale, LucasArts, etc.). § The Magic Door by The Magic Door – The Magic Door is an Alexa-powered interactive adventure game with original stories. You can tell Alexa what choices to make as you explore a magical land with various regions, including a forest, sea, garden and castle. You will collect hidden items, solve riddles, and help magical creatures. § Westworld: The Maze by HBO – Become a host and move through Westworld on 60 possible paths to consciousness, built from show sound effects, storylines and over 2 hours of unique gameplay. § Yes Sire by Volley – You sit as a medieval lord of the realm, presented with an ever-expanding array of difficulty choices. Make good choices and stay in power as long as you can! Volley offers in-skill purchases by selling expansion packs to provide additional scenarios and questions in the adventure story. § Skyrim Very Special Edition by Bethesda – For the very first time ever, take your rightful place as the Dragonborn of legend (again) and explore Skyrim using the power of your own voice...your Thu’um! § Division Network by Ubisoft – The city of Washington DC—and the country itself—are on the brink of total collapse. How did we get here? What happened after the outbreak in New York? Who are the insurgents trying to tear DC apart? And how can you help bring justice and stability back to the country? Tap into the SHD network on your Alexa-enabled device to hear from the agent on the ground in DC, get hints and tips about what has happened since the pandemic broke out, and receive activation instructions from ISAC. § Jeopardy! by Sony – Test your trivia knowledge with new clues every weekday, written by the show’s official writers. Image Credit: Sensible Object Ltd.
§ When in Rome by Sensible Object – The travel trivia game powered by Alexa where real people ask the questions! 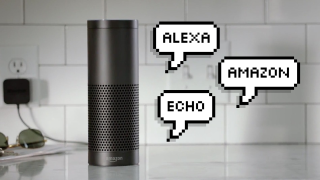 Players set up the board, connect to the ‘When in Rome’ Alexa skill, divide into two teams and get ready to travel the world from the comfort of their home. § St. Noire by X2 – There’s been a murder in the small town of St. Noire – and the killer has promised to strike again! Can you and up to 6 other players solve the mystery before time runs out and the killer gets away? Find the clues, interrogate witnesses and trust absolutely no one. Someone is lying, and if you’re going to crack the case, you’ll need to figure out who…your move, Detective.